The 110 year old transition from 10.8% (in 1901) to 31.2% urban (in 2011) depicts India as an inarguably rural nation (Buch, 2015). Urban settlements in India are islands dispersed in a loosely knit ocean of rurality. We are no strangers to the problems that arise due to lack of integration in our pattern of development: spatially isolated, disempowered communities, inadequate contributions to the GNP (2/3 of the total population producing 1/3 of the total output), lack of availability and accessibility to infrastructure and information, and inefficient, hegemonic socio-economic institutions creating major roadblocks on our long arduous journey towards progress. Following independence, the Indian government launched a plethora of piecemeal approaches to rural development with an understanding of the rural being widely isolated and unintegrated with the urban. By the 1990s, these fragmented approaches were infrequently successful and the 73rd and 74th Constitutional Amendment Acts, exposed the dire need for an integrated comprehensive bottom-up planning methodology from the settlement to the regional scale. Moreover, 90% of information required for a regional administration have a geospatial character as parcels of land, road networks, infrastructure facilities, land use/ cover, etc., which is currently missing from micro-level planning in India. This impacts not just the implementation and evaluation of projects directed at these levels, but its very formulation as a basis for equitable distribution of resources. In this context, the need for geo-spatial Information is further stressed upon since it is a necessity for spatial integration; it may be quite ineffective, if not completely inefficient to govern, administer, plan, or monitor the unique spatial spectrum that such an integration creates. It is therefore indicated here, that the dream of equitable and integrated bottom-up planning can translate into reality only when there is a tool for the identification and geo-spatial planning of the micro-regional unit. This unit in itself cannot be purely urban or rural in itself, but a complex, interlinked and interdependent socio-spatial hybrid of both. One such unit, the rurban is discussed in this paper. A reconnaissance of the literature on rurban helped us realize that it is a relatively new concept whose definitions at different frameworks have been in flux. In order to make it more relevant with the contemporary Indian context, the definition of rurban upheld by the government schemes was given preference. According to the Shyama Prasad Mukherji National Rurban Mission (SPMNRM), the latest programme of the Ministry of Rural Development and Panchayati Raj (2016), a rurban cluster is basically a cluster of villages around a central town, which can be developed together to create various economic, social and physical linkages and bridge the rural urban divide between the two. Since, the arrival of the ‘rurban’ in the vocabulary of the Indian Government is quite recent, it can be expected that the methodology for its planning and development is in an embryonic stage; more so when it comes to integrated spatial planning which is as new and dynamic a concept, as the rurban itself. In this backdrop, a very specific hiatus in spatio-temporal and spatio-economic planning was identified: the need for a standardized geo-spatial planning methodology and a geo-spatial information support system that would support the various stages of this methodology. Together they constitute “A Model for Geo- Spatial Information Approach to Planning for Rurban Clusters”. A spatially contiguous cluster of villages around a central town, each unique in their demographic and socio-economic identities, but intimately related to one another through ruralurban linkages which can be developed to bridge the rural urban divide and foster an integrated development for both. Geo-Spatial Information System is a combinations of dataware, hardware, software and networks of humans and organizations (orgware) that work together collect, process, store, retrieve, manipulate and disseminate information to support decision making, coordination, control, analysis, and visualization of geo-spatial data. At present, the geo-spatial information systems for planning in the country are not only limited but largely unintegrated with one another. A look at some of the foremost geo-spatial information systems in the country, namely, DISNIC, NUIS, ENVIS, BHUVAN and GIS Based Master Planning for AMRUT Cities reveals that the number of available information systems were positively biased towards the urban. Those information systems which did not confine themselves to the urban had data on scales unfit for rurban cluster planning (e.g. ENVIS). DISNIC contained some relevant parameters for rurban cluster planning, whereas others contained discrete parameters which would be relevant if integrated with DISNIC. Despite containing some of the parameters that were required for rurban cluster planning, there was no system for integrating them and bringing them under a common umbrella. This created a demand for a dedicated, integrated geo-spatial information system for rurban clusters and a conceptual outline for the dataware, hardware, software and orgware for the geospatial planning information system for rurban clusters was briefly chalked out. 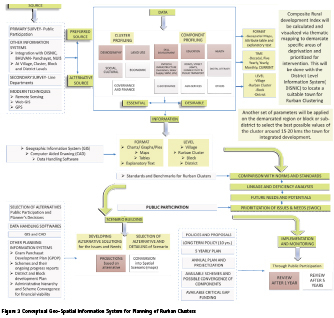 These components were later detailed out under each stage of the standardized planning methodology for rurban clusters and if a mapping is made, these components can clearly be traced to their relevant stages in the planning process (Figure 1). The first step in developing an approach for rurban cluster planning was to look at the existing approaches for spatial entities which closely resembled the rurban. The constantly evolving and relatively recent nature of the rurban concept were important contributors to its absence of a tested standardized planning methodology. Parallel concepts (Mandal Model, Gujarat Model, Micro-regions by FAO, etc.) were explored, each of which enriched our understanding of what is required in the planning of rurban clusters. Mandal, in 1989, was one of the first Indians to research on rurban areas, which he defined as overgrown villages with a distinctive rural character that is reserved within them. Some of the important considerations that were borrowed from Mandal’s work was the delineation criteria for rurban areas using a Rurban Index (10 parameters), Functional hierarchy of settlements on the basis of their nodal approach. This a rational, objective and systematic approach to planning laid the foundation of the geo-spatial approach to planning. The Gujarat Summit of 2001 and 2012 which gave birth to the PURA and Gujarat Models for rural cluster development was used to define the objective of rurban development as the promotion of integrated development, better connectivity, employment and infrastructure. “Planning for Micro-Regions”, FAO inculcated the values of bottom-up, participatory, action-oriented and sustainable in planning through a four phase (analysis-scenario writing-sectoral strategy building-project profiling) approach. Earlier works of the authors on rural and rurban development was used as the ground-work for the spatial criteria for rurban cluster delineation with the help of a Composite Rural Development Index. As a result of this, spatially identifying the area most suitable for rurban development in the district became possible. It also led to an understanding the prominent linkages between the town centre and the village cluster and providing a brief idea of their future spatial growth to assist further planning. Finally, borrowing from all neighboring concepts, literature study and a brief understanding of the legislative frameworks within which the rurban shall conform to, a 10 stage, standardized system’s approach to planning of rurban clusters was laid down (Figure 2). 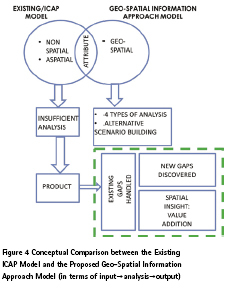 These stages were reexamined, developed and detailed to expose the need for the intervention of a geo-spatial information system in every step of the planning process (Figure 3). The unique and definitive aspect of the model is the intervention of a geo-spatial information in every stage of the standardized planning methodology. The model tries to improvise the existing nature of rurban cluster planning by adding new stages as well as exploring them through a geo-spatially oriented delineation, data-base generation, analysis, scenario building up to implementation, monitoring and evaluation. ▪ Information base, which is derived from the database is categorized on the basis of its format for representation, level of information, time of updation. In total, it looks at 4 times more areas than the ICAP Guidelines do, while facilitating data standardization, multi-hierarchical planning based on critical thinking through spatial representation and securing its claim for efficiency and effectiveness. ▪ An intelligently designed information base enriches the analysis stage by provide multiple ways of analyzing the data to yield multi-faceted interpretations. This stage explores 4 times the type of analyses performed by the ICAPs. ▪ A democratic and participatory process of alternative scenario building and selection, post-analysis, helps both the administration and the beneficiaries understand the consequences of their choices through Participatory GIS. ▪ Proposals take into consideration an in-depth spatial analysis of the present needs, strengths, weaknesses, opportunities, challenges and resources. They are further divided into phases that help incrementally achieve a broad vision for the area. ▪ Spatially identifiable proposals foster an equitable, transparent and accountable distribution of resources. A geospatial MIS, instead of a non-spatial one, helps maintain a spatial and hence tangible record of all projects and their ongoing progress, helps lay the groundwork for the establishment of successful integrated spatial e-governance. In order to test the applicability of this model, it was applied on a tribal cluster in the Khunti District of Jharkhand. This led to an in-depth analysis of the on-ground functioning of the geospatial approach to rurban cluster planning and helped bring about certain essential modifications to smoothen out the process of its application. It also helped us understand the core function of the geospatial information approach vis-à-vis the old ICAP model for rurban cluster planning, which can be summarized accurately with the help of Figure 4. The Geospatial Information Systems Model with clearly defined and easily available inputs and analysis yields better and efficient results as compared to the traditional method. This was demonstrated through all the stages of the application of the model. The old/ ICAP model did not have stages such as formulation of goals and objectives, database design and generation, conversion of database into information base and alternative scenario building. These stages are crucial to sequential flow of the planning logic and were completely ignored in the old method inviting confusion and unrequited subjectivity in the planning of rurban clusters. Even the analysis phase is not clearly outlined and lacked the usage of alternative analysis techniques to prioritize results. The geo-spatial information approach model takes care of the issues highlighted while adding to the overall value of the planning process. The Integrated Cluster Action Plan does talk about a spatial approach to planning for rurban clusters, but fails to achieve so by conceiving that spatial planning is only limited to the mapping of existing land use. The primary aim of the study was to recommend that the ICAP Guidelines need to be oriented more towards the spatial (rather geo-spatial) since it brings an unparelled amount of insight and value addition by addressing the gaps the existing method cannot. Since no planning activity can take place in the absence of data (especially geo-spatial data), the guidelines need to lay special emphasis on designing database and condensing it into an information base (focusing on essential, geo-spatial data). The delineation criteria for the rurban cluster needs to be based on data that is easily available and can be spatially represented (input parameters instead of output parameters). The criteria, weights, baseline and other desirable elements need to be explored in depth and detailed out geo-spatially in the ICAP Guidelines to prevent political bias in the delineation of the cluster. The geo-spatial information support can be integrated with the existing framework of the District Level Information System since most of the parameters required for rurban planning is already collected ( on a statistical and not spatial format) by the DISNIC. 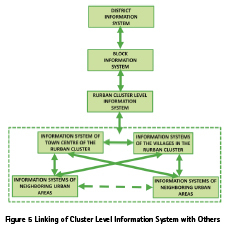 A link between the various platforms for geo-spatial information systems flowing from the district to the block, rurban cluster and its component rural and urban settlements and their neighbors has also been proposed (Figure 5). It is one of the goals of the geo-spatial information system model to standardize the planning of settlements in order to make them compatible for an integrated multi-hierarchical system of plans. Such Geo-spatial Information Systems should be available in Hindi and other local/regional languages for efficiency, effectiveness and better participation from the public in planning and implementation. The geo-spatial information approach to rurban cluster planning has certain prerequisites for successful functioning. These include adhering to the database and information base design while ensuring it is adaptable to the evolving needs of the area, ensuring adequate stakeholder participation, multihierarchical framework for planning, technical knowledge and expertise and the sharing of resources skills and ideas. Overall, the main characteristics of SPMNRM is that it cannot be implemented with the effort of an individual or an organization only. The existing institutional framework as per the 73rd and 74th CAA does not provide legitimacy to the rurban cluster and therefore the model is not backed by a statutory provision of rurban clusters. Therefore, without a few necessary changes in the institutional framework, the model may not be applicable. It is a task in coordination, enthusiasm, knowledge and the deliberate intention to make faster, better, costeffective and transparent plans for the people, of the people and by the people. Therefore, it must be the development agenda at the state and national level to procure and utilize geospatial data to ensure the efficiency, effectiveness and equity that is currently missing from planning and implementation. Banerjee, A. (2018) A Model for Geo-Spatial Information Approach to Planning for Rurban Clusters, Unpublished Bachelor Thesis, School of Planning and Architecture, New Delhi. Chatterjee, S. (2014) “The ‘Rurban’ Society in India: new facets of Urbanism and its Challenges”, IOSR Journal of Humanities and Social Science (IOSRJHSS), Vol 19(8), pp. 14-18. Dogra, A. (2005) Developing a Geo- Spatial Information Systems Based Model for Micro Level Planning, Unpublished Bachelor Thesis, School of Planning and Architecture, New Delhi. Mahavir (1996) Modelling Settlement Patterns for Metropolitan Regions: Inputs from Remote Sensing; ITC Publication No. 35, Enschede, The Netherlands. Mahavir (2005) Focus on Essential Data: Improving Plan-Making by Selective Collection of Geo-Information, GIM International, 29/12/2005 Mahavir (2010) Geospatial Vision or Lack of it for Urban India, SPACE, The SPA Journal of Planning and Architecture, Vol. 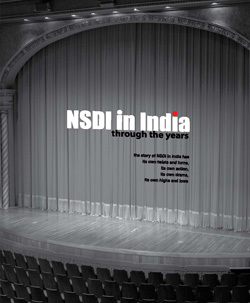 15(1), New Delhi. Ministry of Rural Development (2016) Integrated Cluster Action Plan for the SPMNRM, Government of India. Press Information Bureau, Cabinet (2015) Union Cabinet approves Shyama Prasad Mukherji Rurban Mission to drive economic, social and infrastructure development in rural areas, Government of India, Accessed on December 2, 2017.